A brief history of Headley Theatre Club . . .
A village pageant was organised in 1951 to celebrate the Festival of Britain. The success of this led directly to a second pageant in 1953 celebrating the Queen's Coronation, and also to the formation of Headley Theatre Club in 1952. The prime object of the Club, as stated in our Original Constitution, is "To unite the village in good fellowship", and this we still strive to do. 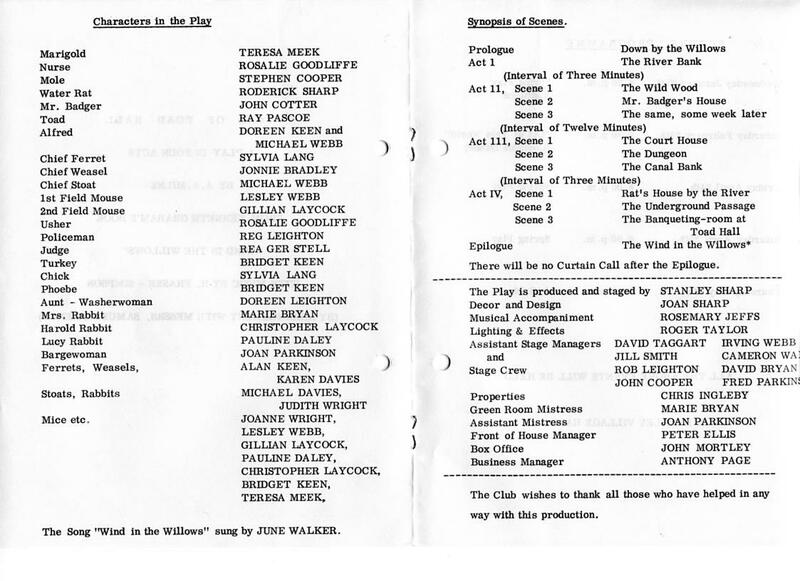 There was much criticism voiced at the time about the choice of name for this organisation  it was thought by some that the term 'Theatre Club' sounded too exclusive for a village amateur dramatic society . . . but it stuck.
. . . including a Pantomime (nearly) every year since 1952  Oh yes we did! Nov Sponsored "24 hr Shakespeare"
Nov Sponsored "24 hr Comedy"
Jul Old Time Music Medley (+ at Lindford WMC) - included boys' striptease! Oct Calendar Girls  cast  photos  the calendar!  for more information, contact Janet or link to HTC e-mail.